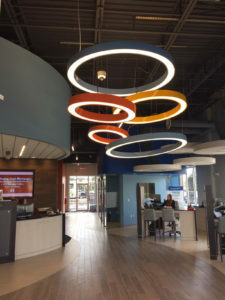 When you are ready to create a space to reflect a brand, colors, or individual personality, PMC Lighting has the power to customize lighting to your unique specifications, needs, and desires. There is no longer a need to have uninspired light fixtures in a building or space. We can create a product to fit the application not the other way around. We learn your design needs and create lighting solutions to satisfy them. What are some of the ways that you can customize a lighting experience? Choose from a wide range of standard lumen outputs on the majority of our fixture models, and if that isn’t enough, using programmable electronic drivers makes it possible to dial in the exact combination of lumen output and fixture wattage to satisfy just about any application. With our PMC Lighting Build-2-Spec focus and philosophy, we can build a custom fixture that fits a distinctive space. Today, a non-standard space doesn’t mean that you lack product options. 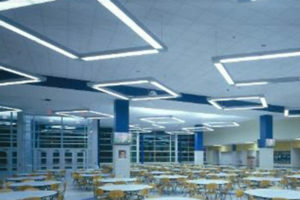 We can take your specifications and create a fixture to fit. 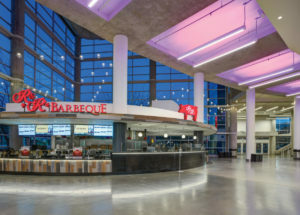 Developing custom length fixtures for wall to wall applications, or simply where the space requires it, is not a problem with most fixture models. We regularly build custom length fixtures down to ¼” increments to fit the most exacting applications. Custom patterns with mitered odd angle corners, cross section width and height changes to meet structural restrictions and modifications based on unusual mounting conditions are all examples of the types of customizations we do on a regular basis. Light fixtures no longer need to be a straight line. 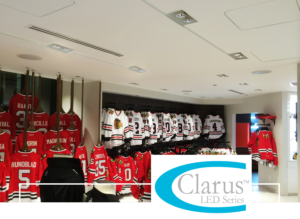 LED lighting with our ArcX Series fixtures bring a new dimension to a space. With ArcX curves, the sense of movement that fixtures can bring to a space means that design possibilities are nearly endless. Shape and style combine with versatility, efficiency, and performance. Whether it is the color of the luminaire itself or the light emitted from the source, color tells its own story. We can paint fixtures to match any desired color or branding palette and our Aura tunable solutions make it possible to emit all of the colors in the spectrum. Match your brand colors, create a sense of fun or a special mood in a space with colored light. With PMC Lighting’s partnership with Vital Vio, we bring the ultimate function to our luminaires: the power of light to fight bacteria. Light is no longer ‘just’ illumination. In airports, gyms, restrooms, daycares, restaurants, and other public spaces, PMC’s pūr-led products powered with Vital Vio’s White Light Disinfection® Technology decrease surface bacteria with the flip of a switch, providing safe and effective continuous disinfection around the clock. Whether mimicking actual daylight patterns by adjusting color temperature and brightness throughout the day or lighting an area to maximize productivity and focus, we can help with our tunable light solutions. 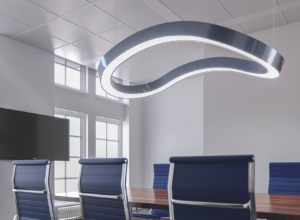 From warm to cool, our tunable white light solutions can help to provide visual comfort throughout the day and the light emitted from the fixture can create a mood, contribute to the ambiance and increase productivity.